This PhenixID Solution Document (PSD) is written for PhenixID Server. This PSD describes how to customize Signing/Seal Service in PhenixID Server. The reader of this PSD should have some basic knowledge about PhenixID Server. NOTE: If Federated signing (API) is used, this page can be also be customized. 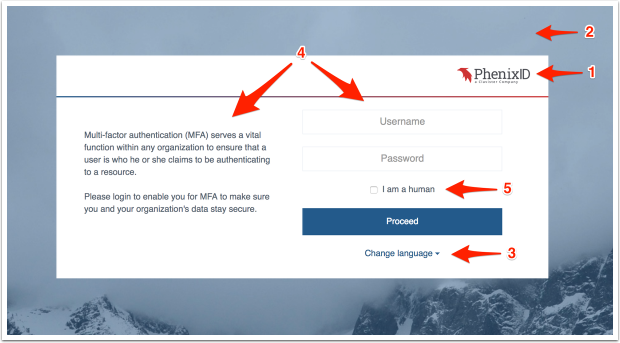 Since authentication has already been done in this scenario, only configuration of the signing page will be made. See last part of document. NOTE: Changes will be made to files that are located in modules for the current version of PhenixID Server. Meaning that the customizations made, needs to be manually transferred to the new module version when upgrade is made (except for the file phenix-store.json). The instructions in this document will help you customize Signing/Seal Service in PhenixID Server. So please make sure that you have a recent copy/backup of these files. Changes to the configuration file phenix-store.json should be made using the configuration portal. NOTE: Changes made to the files above are located in modules for the current version of PhenixID Server. Meaning that the customizations made, needs to be manually transferred to the new module version when upgrade is made (except for the file phenix-store.json). We can make changes to the parts of the web page numbered above. Follow the steps below for the respective parts of the page. Remember to have a backup of the files being changed. on the AUTHENTICATOR used for Signing/Seal Service and set it to false. and customize the text according to your requirements. 5. "I am a human"
Use the example below and paste it into a new file called logo.css. To change the name displayed on the page, go to the Advanced tab in the configuration portal, click the pen next to Modules and search for com.phenixidentity~phenix-prism-signingclient. Change the value "display_name" : "PhenixID Document Signing/Seal" to reflect your text, for example "display_name" : "CompanyName Signing". To change the name displayed for the web page, go to the Advanced tab in the configuration portal, click the pen next to Modules and find for the com.phenixidentity~phenix-prism module associated with the signing client module. Easiest way would be to search for the id of the signing module. Change the value for "display_name" : "PhenixID Document Signing/Seal" to desired text. Logotype can be changed in the same way as explained above, for Signing/Seal. Image folder needs to be created.